What is Optimmune Ophthalmic Ointment? Optimmune Ophthalmic Ointment is a sterile eye ointment containing cyclosporine, which helps to treat keratoconjunctivitis sicca (KCS or dry eye) in dogs. It reduces inflammation, stimulates tear production, and helps to reduce damage to the tear glands. Optimmune Ophthalmic Ointment requires a prescription from your veterinarian. How Optimmune Ophthalmic Ointment work? Optimmune Ophthalmic Ointment contains cyclosporine, which has broad anti-inflammatory effects that help to reduce damage to the tear glands while also stimulating tear production. Optimmune Ophthalmic Ointment also reduces eye inflammation. Do not touch the tube opening to any surface, including eyes or hands. This medication may cause blurred vision. Avoid using other eye medications unless approved by your veterinarian. What is the most important thing I should know about Optimmune Ophthalmic Ointment? 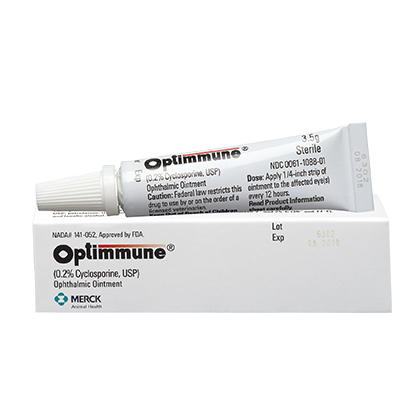 Optimmune Ophthalmic Ointment is an immunosuppressive agent used to reduce inflammation in the eye(s). It is used to treat chronic dry eye (KCS, keratoconjunctivitis sicca) that may be caused by inflammation. Optimmune Ophthalmic Ointment may also be used for purposes other than those listed. Optimmune Ophthalmic Ointment is FDA approved for veterinary use in dogs only. Optimmune Ophthalmic Ointment is a prescription medication available as a sterile eye ointment. The sterile ointment is usually applied as a ¼ inch strip to the eye(s) every 12 hours. Do not touch the tube opening to any surface, including eyes and hands. The tube opening is sterile. If it becomes contaminated, it could cause an infection in the eye. What should I discuss with my veterinarian before using Optimmune Ophthalmic Ointment on my pet? Do not use Optimmune Ophthalmic Ointment if your pet has any type of infection in the eye(s). Tell your veterinarian if your pet is pregnant or lactating. How should Optimmune Ophthalmic Ointment be used? Use this medication exactly as directed by your veterinarian. If you do not understand the directions ask your pharmacist or veterinarian to explain them to you. Wash your hands prior to using the eye ointment. Apply a ¼ inch strip of the ointment into the lower eyelid. 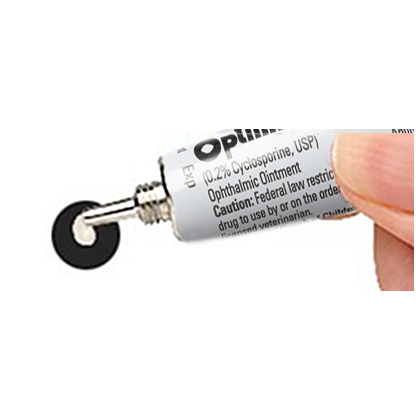 Store Optimmune Ophthalmic Ointment at room temperature, away from moisture and heat. Keep the tube properly capped. What are the potential side effects of Optimmune Ophthalmic Ointment? Serious side effects are not expected. Some burning, redness, tearing, discharge, pain, itching, stinging, or blurring of the vision may occur. Continue the medication and talk to your veterinarian about any side effect that seems unusual or bothersome to your pet. What happens if I miss applying a dose of Optimmune Ophthalmic Ointment? What happens if I overdose my pet on Optimmune Ophthalmic Ointment? What should I avoid while applying Optimmune Ophthalmic Ointment on my pet? Do not touch the tube opening to any surface including eyes or hands. This medication may cause blurred vision. Avoid using other eye medications unless approved by your veterinarian. What other drugs will affect Optimmune Ophthalmic Ointment? Before using Optimmune Ophthalmic Ointment, tell your veterinarian if your pet is using other eye ointment or eye medications. Drugs other than those listed may also interact with Optimmune Ophthalmic Ointment. Talk to your veterinarian or pharmacist before giving any prescription or over the counter medicines. Optimmune Ophthalmic Ointment Ointment, a prescription medication, is used in dogs for the management of chronic keratoconjunctivitis sicca (KCS or 'dry eye"). Optimmune Ophthalmic Ointment Ointment is an immunosuppressive agent used to reduce inflammation in the eye(s). Optimmune Ophthalmic Ointment Ointment is used in dogs only. Do not use in cats. The tube opening is sterile. Do not touch the tube opening to any surface, including eyes and hands. If the opening becomes contaminated, it could cause an infection in the eye(s). Store this product at room temperature, away from moisture and heat. Keep the tube properly capped. Active Ingredients (per gram): 2 mg cyclosporine USP, petrolatum USP, corn oil NF, petrolatum and lanolin alcohol.